Over three days, more than 6,000 individual web streams of live video content were delivered as people from around the world tuned in online to watch the General Synod debate key issues at Church House Conference Centre, including plans to fast track the appointment of women bishops. The Church of England’s latest meeting was broadcast around the world by Church House Conference Centre’s in-house AV team using cutting edge technology. Following an investment of more than £110,000, the Westminster venue recently installed five high definition (HD) broadcast quality cameras, a Tricaster vision mixer, IPTV system for internal distribution, and supporting equipment to enable its in-house AV team to web stream events to a global audience. 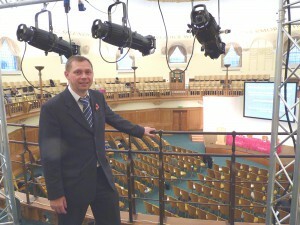 The General Synod takes full advantage of Church House Conference Centre’s AV capabilities. As well as the use of live web streaming and video on demand (VOD), members also used its digital voting system and a Twitter wall by logging into the venue’s WiFi and 100Mbps broadband line.